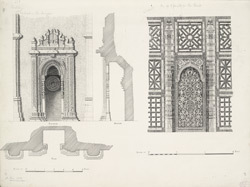 Pen-and-ink details of a mihrab in the mosque (left) and three panels in the tomb (right) at Sarkhej, Gujarat, by an anonymous artist between 1884 and 1886. This image is from the Burgess collection, an album of 49 drawings of plans, sections, elevations, sculpture and architectural details of Muhammadan monuments in Ahmadabad and the surrounding areas made between 1884 and 1886. The drawings were prepared mainly by Indian draftsmen under the supervision of James Burgess (1832-1916). Burgess was in India from 1855 to 1889, he served as the Archaeological Surveyor and Reporter for Western India 1874-80, with South India added 1881-85 before becoming the Director General of the Archaeological Survey of India in 1886 until he retired in 1889. Situated on the banks of the Sabarmati River, Ahmadabad was founded by Ahmad Shah, Sultan of Gujarat, in 1411 on the site of the village of Asaval. The dynasty ruled until 1537 when Sultan Bahadur Shah was killed by the Portuguese at Diu. Gujarat was annexed by the Mughal emperor Akbar in 1572. The city is architecturally interesting as it boasts many examples of fifteenth- and sixteenth-century Gujarati provincial Islamic architecture. The complex at Sarkhej, a few kilometres outside Ahmadabad itself, was begun as a 'dargah' or shrine to Shaikh Ahmad Khattu, a highly respected religious figure and one of the co-founders of the city of Ahmadabad, during the reign of Muhammad Shah (r. 1442-1451). Together with the saint's tomb, a congregational mosque, royal tombs including that of Mahmud Begarha (r. 1458-1511), and palaces were constructed around the large tank at the site over the course of the next century. This drawing shows one of the 'mihrabs' or prayer niches in the mosque on the left together with a section from a carved pierced screen or 'jali' from one of the royal tombs on the right.